One of my favorite breakfast is Gallo Pinto. Rice and Black beans, what a combo. I got used to it when living in Costa Rica for a while. I got it every day and wasn´t to fond of it to begin with, but learned to love it. So good for your digestion. 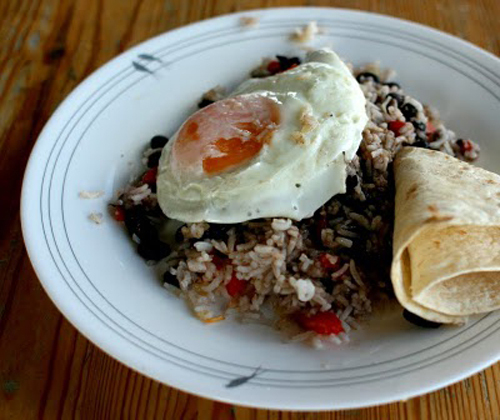 I serve the Gallo Pinto with an egg, sunny side up or over easy and often with corn tortillas. I make a lot and put few portions in the freezer. 2 cups cooked black beans or one can. All the veggies diced small. On a pan in a veggie oil cook onion, red pepper, carrot, garlic, chile pepper. Then you add rice and cooked beans. Then some coriander and salt to taste. This video shows you well how this is done. Served with a glass of chrispy citrus white wine or Mimosa…well even Bloody Mary on a beautiful saturday morning. p.s…This is one of those dishes that just gets better reheated.